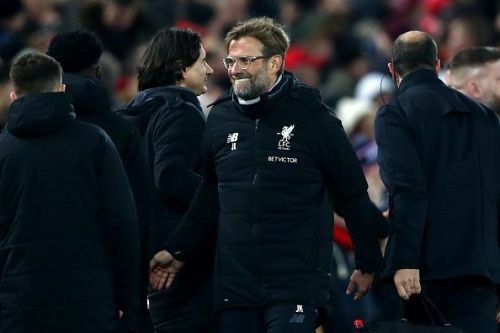 Fans and neutrals were treated to a thoroughly entertaining seven-goal thriller at Merseyside on Sunday night as Manchester City were condemned to a 4-3 defeat against a lively, if shaky, Liverpool side. Their first domestic defeat snaps a 30-match unbeaten streak in the Premier League and is only their second loss all season long. Liverpool were nothing short of exemplary going forward although they were unsatisfactory at the other end of the pitch. Despite the lapse in defence, Liverpool fully deserved to clinch all three points. Here are some key stats from the match. This was a big loss for Man City and the scoreline would've been a lot less comforting were it not for Liverpool's lacklustre defending. However, that does take away from the fact that they have been astounding thus far and the strong reaction this loss has elicited amongst fans and neutrals alike is a testament to City's high standards this season. Despite the loss, City still managed to pull 3 goals back, which highlights their pedigree and undeniable ability. Pep Guardiola's side will almost certainly emerge from this encounter stronger, wiser, and better prepared for the challenges that lie ahead.